GTECH G2’s new “X Factor Steps to Stardom” slots game launched today across its International Bingo Network just in time for the new X Factor TV series that begins on UK TV this Saturday. “X Factor Steps to Stardom” is a brand new five-reel, 20-line slot machine based on the X Factor TV series. Like the hugely popular television program, it features a special Judges Bonus Round, its very own Boot Camp and a live final round. Players will also recognize the catchy X Factor theme song that plays throughout. To celebrate the launch of the new X Factor game, the International Bingo Network (IBN) is hosting a special X Factor “Top Slotter” competition every weekend throughout August. The player at the top of the leader board at the end of the month will be crowned the X Factor Steps to Stardom Champion and win tickets to a live X Factor show and a great cash prize. In addition, the top fifty players will be inducted into the X Factor Hall of Fame with additional cash prizes for the runners up. 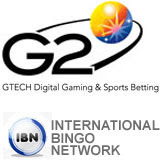 The International Bingo Network (IBN) is operated by St Minver which, along with Boss Media, Finsoft and Dynamite Idea, is now part of GTECH G2, the igaming division of lottery industry leader, GTECH. “The X Factor game is just one of many exciting new branded games that are being launched by the International Bingo Network over the next few months with local versions of many of the games being launched across our network of bingo sites in seven other European markets “ said Alison Digges, GTECH G2 Group Head of Bingo. The IBN includes such popular bingo sites as Littlewoods Bingo, Yahoo Games and the Daily Mail’s Coffee Break Bingo. It features 90-ball bingo games, big jackpots, exciting tournaments and generous bonuses.